Organize Your Sewing Space for the New Year! The top resolutions for sewers seem to be the same every year: to complete unfinished projects (affectionately known as UFO’s), and better organize sewing spaces. While we can only offer you words of support to help you tackle that pile of UFO’s, we’re definitely here to help you with organization! We’ve collected a whole list of tips and tutorials geared towards getting it all together. And who knows – once your space is clean and everything is in its place, you may be inspired to finally finish those UFO’s! There are lots of creative ways to store fabric, such as neatly folding fabric to fit in shelves, bins or cabinets. 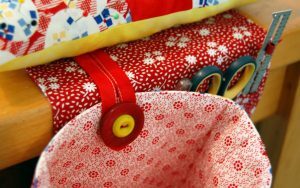 Check out this article from everythingetsy.com where you’ll find 13 different creative ideas for stashing your fabric. And what about that growing mountain of fabric scraps, you ask? We’ve found the most common way to store scraps is to first organize them by color, then use containers or bins to sort scraps. 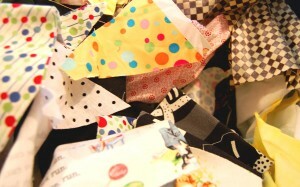 See some great examples of scrap storage at the American Sewing Guilt’s blog article, 5 Ways to Organize Fabric Scraps. Clockwise from left; I use slimline boxes similar to Jo’s fav’s – available at most fabric and sewing stores, I found that spools if Isacord embroidery thread fit perfectly in clear shoe storage boxes, a hardware organizer from the local hardware store is perfect for keeping small thread spools organized, and nothing beats a good old fashioned thread rack! 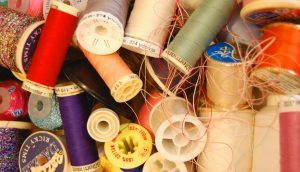 If you want to learn why it is important to keep your thread organized, read my article “When Good Thread Goes Bad“. 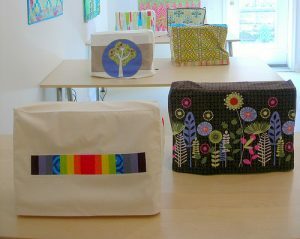 Want to have fun sewing AND keep organized at the same time? Try any one of these handy organizer tutorials that are just right for keeping your sewing space clean. Bins and baskets hold fabric scraps, notions, patterns, yarn, or any other sewing or crafting stuff that needs storing. 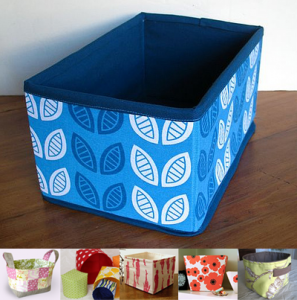 You’re sure to find the perfect bin or basket at Jessica’s Fabric Basket and Bin Tutorial Round-up at How About Orange. Having an organizer right next to your sewing machine can help you keep track of your pins and needles, thread snips, sewing gauge, and give you a place to throw those little threads instead of on the floor. Make a pincushion, tool holder, and thread catcher with this tutorial from Sew, Mama, Sew! Help keep your sewing machine in tip-top shape by sewing up a custom cover to keep it protected from dust and lint in your sewing space. This simple tutorial allows you to either make a simple cover with your favorite fabric, or to embellish your cover with patchwork, applique, or embroidery. Find the Sewing Machine Cover Tutorial at Spool Sewing. 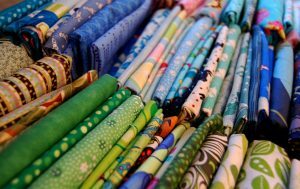 Want even MORE inspiration for organizing your sewing room for the new year? 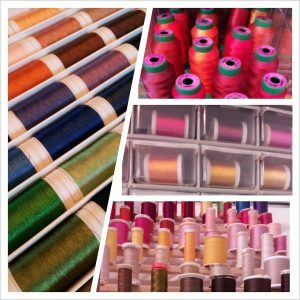 Check out our WeAllSew Pinterest Sewing Spaces board for many, many more ideas.